Some mornings, when snow slumps down over your house like a wet blanket, you can't help but feel a thin chill creep into you. Despite the five blankets you've wrapped yourself in, the hot chocolate steaming in your hand, the hat on your head, and the infinite treasure trove of goodish/ mostly-bad movies on Netflix flashing at you. It just gets at you. Which is probably why God invented soup. It's been years since I've had a classic mushroom soup. Something that hit me as truly, deeply mushroomy -- that gave me the feeling that I was eating something somebody's grandma perfected long ago and passed down from generation to generation (everyone knows grandmas perfected soup, even if they didn't invent it). 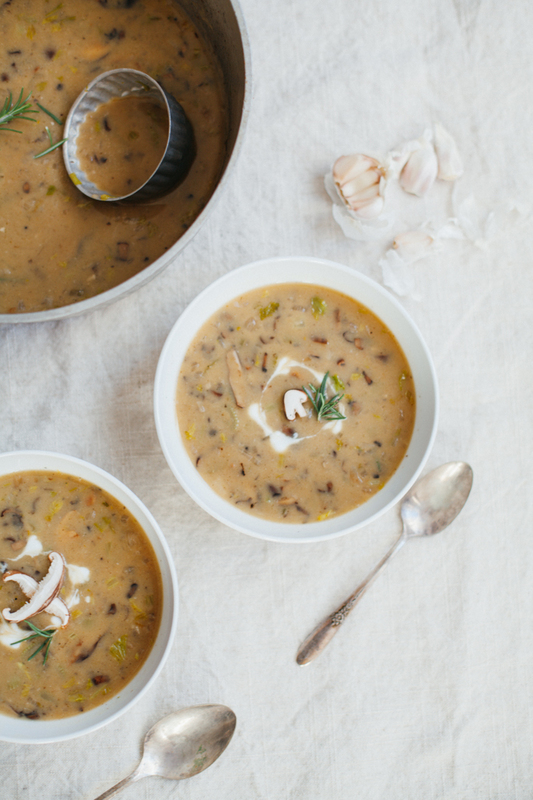 This mushroom soup gave me that feeling -- and it's vegan! Even though it's made with coconut milk, this dish doesn't have a coconut flavor. It really works as a cream replacement, making this healthier than a traditional mushroom soup. I dig that. Todays giveaway, as part of the J. Q. Dickinson Friendsgiving Potluck this week, is on instagram! Check out my feed for the details -- you could win a 1 ounce jar of J. Q. Dickinson Sea Salt and a hand-made mini cherry wood salt cellar (and a little secret gift from me!). I'll be giving away salt & salt cellars every day this week so keep checking back! And follow along with this virtual potluck with the hashtag #jqdfriendsgiving on instagram. And guess what?! I made a Stellar about it! So you can see the pretty Friendsgiving dishes all in one place and link to them from there. Check out the rest of the awesome J. Q. Dickingson Friendsgiving recipes (and giveaways) happening this week from these great bloggers! And keep an eye out for posts as part of the potluck from these ladies later this week! Remove the stems from the shiitake and crimini mushrooms. Roughly chop the stems and add them to a pot full of the vegetable broth. Simmer the stock on low for 40 minutes to an hour. While the stock is reducing and concentrating, heat your coconut oil in a large soup pot over medium heat. Add the minced shallot and cook through until transparent, stirring often. Add the celery and cook 5 minutes further. Deglaze the pot with the bourbon whiskey, stirring to mix evenly. Strip the leaves from your sprig of rosemary and add them to the pot. Add the coconut milk and remove from heat. Heat a wide 12" cast iron pan over medium-high heat (otherwise use a wide non-stick pan). Precisely slice the shiitake caps into thin strips. Add to the hot pan and cook down until most of the liquid has released from the mushrooms, stirring occasionally. Add 1 tablespoon coconut oil or ghee and cook further until beginning to crisp. Remove the shiitake from the pan and add to the shallot, celery, and coconut milk base. While the shiitakes are cooking, precisely mince the crimini caps into very small cubes (1/8 inch at most). Once the shiitake has finished cooking and has been added to the shallot, celery, and coconut milk base add the crimini to your hot cast iron pan. Cook the mushrooms until most of the liquid has cooked off (about 10 minutes). Add 1 tablespoon ghee and cook further until just beginning to crisp. Remove from heat and add to the shallot, celery, shiitake, and coconut milk base. Once the stock has finished concentrating, strain out the mushroom stalks and add the mushroom infused stock to the cooked vegetables and mushrooms. Add 1 cup water. Add J. Q. Dickinson coarse sea salt and freshly ground black pepper to taste. I personally added about 1 teaspoon of salt and a teaspoon of pepper, with a sprinkle more on top of each bowl that I served.